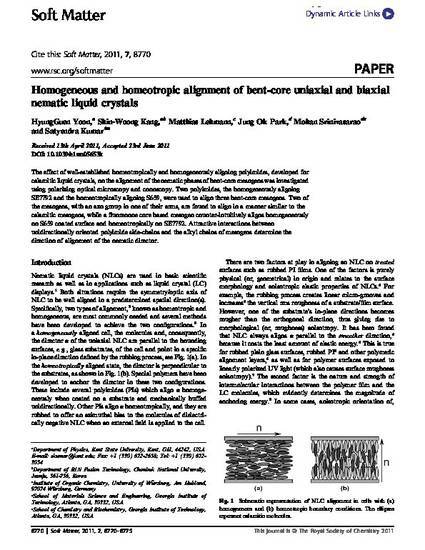 The effect of well-established homeotropically and homogeneously aligning polyimides, developed for calamitic liquid crystals, on the alignment of the nematic phases of bent-core mesogens was investigated using polarizing optical microscopy and conoscopy. Two polyimides, the homogeneously aligning SE7792 and the homeotropically aligning S659, were used to align three bent-core mesogens. Two of the mesogens, with an azo group in one of their arms, are found to align in a manner similar to the calamitic mesogens, while a fluorenone core based mesogen counter-intuitively aligns homogeneously on S659 coated surface and homeotropically on SE7792. Attractive interactions between unidirectionally oriented polyimide side-chains and the alkyl chains of mesogens determine the direction of alignment of the nematic director. Copyright 1992 American Physical Society. Available on publisher's site.